Der Staat gegen Fritz Bauer, winner of the audience award at the Locarno Film Festival, is a beautifully-made drama about the struggle for justice in post-war Germany. It’s 1957, and Fritz Bauer is the district attorney of Hessen, based in Frankfurt. Whereas the fledgling Federal Republic wants to put its recent Nazi past firmly behind it, uncompromising Bauer is determined to root out war criminals and bring them to justice. When he gets a tip that former SS officer Adolf Eichmann is hiding under an assumed name in Buenos Aires, he digs into the case with relish. But there is resistance in the highest circles against bringing Eichmann to trial. Files are disappearing from Bauer’s office, and both the senior prosecutor and BKA (criminal investigation) officials start throwing obstacles in his path. Together with a young colleague named Angermann who believes in the moral rightness of his cause, Bauer begins a protracted struggle against invisible enemies within the system. Bauer knows that the BND (intelligence service) won’t help him either, and that they might in fact tip Eichmann off that he’s being watched. The German higher-ups, many of them former Nazis, are afraid he’ll name some of them at trial. Despite Bauer’s suspicion that a sketchy but well-connected journalist might work for the BND or even the East German Stasi, he hires him to poke around for information in Argentina — beggars like Bauer can’t be choosers. Bauer undertakes a secret journey to Israel, where he relays information about Eichmann’s whereabouts to the national intelligence agency, the Mossad. Since Argentina won’t deport him, the Israelis plan to kidnap Eichmann and try him there. Bauer desperately wants him brought to Germany for trial, where he can serve as an example. But Israel has its own plans. Meanwhile, German officials are breathing down the necks of Bauer and Angermann in private matters. They threaten to expose them under Paragraph 157, the penal code making male homosexuality a crime. It looks as though their hunt for Eichmann might ruin them absolutely. Who was Fritz Bauer, this stubborn and lonely, yet humorous and deeply humanistic Mensch? The youngest man to receive a doctorate of laws in Germany, he had already been a socialist as a teenager. In 1933, he was interned in a concentration camp. Upon release, he headed to Denmark and Sweden, where he founded the Socialist Tribune with Willy Brandt. Bauer returned to postwar Germany in 1949, reentering civil service in the justice system. 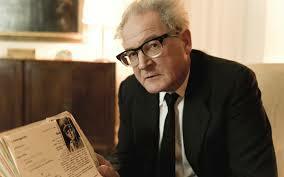 The People vs. Fritz Bauer seamlessly combines original 1950s video with reconstructed scenes. Especially good is Bauer’s talk show interview, where he speaks with young people about the nation’s need to face its past. The scene shows how Bauer served as an important inspiration for the student revolts to follow in the 60s, giving youth of the Adenauer era a new perspective by daring to lift back the veil of silence which their parents had drawn across the Nazi era. Powerful actor Burghart Klaußner (The White Ribbon) convincingly captures Bauer’s quirks, including his Swabian dialect and peculiar speech rhythms. Look for him (Klaußner, not Bauer) in Steven Spielberg’s Cold War spy thriller, Bridge of Spies. Production designer Cora Pratz avoids kitsch while hitting the nail on the head with her late-50s sets. Fritz Bauer is supposed to have said, “When I leave my office, I’m entering enemy territory,” and yet he persisted to the end. In post-war Germany, there weren’t many people who could be considered heroes, and yet he was one. Fritz Bauer’s stubbornness and courage provide inspiration for everyone who still believes in standing against injustice in the 21st century.